Traveling? This site lists pretty much all local dances and weekends in the country! There are many other forms of social dancing available in Columbus; it’s quite possible to dance every day of the week! 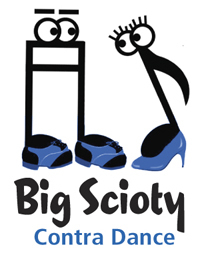 A group including Big Scioty and several other area folk dance groups. A Dance Calendar is available. First, third and fifth Sundays at 7:30 pm. Clinton Heights Lutheran Church, at the corner of N. High St. and Clinton Heights Avenue. Live Music. Third Sunday only during Summer. Country Dance Weekend in October during even years. Tuesdays 8-11 pm, 46 E. 16th Ave.
Whetstone Recreation Center 3923 N. High St.
Gates-Fourth United Methodist Church, 1234 South Fourth Street, Columbus. Various Sundays, 4-6 pm, live music.